Back when Tony Fratto was arguing that we should shut down post offices because he uses the InterToobz and therefore only ventures into an actual post office once a year, I noted that we would effectively be kicking huge portions of our rural areas out of our country if we presumed everyone could replace the postal service with broadband, as the map here makes clear. The NYT has a story focusing on one of the places Fratto is apparently willing to lose as part of this country: Idaho, which just got rated as the state with the worst broadband access. The story starts with an anecdote of how bears brought down a manufacturing company’s broadband. But I was particularly struck by this quote. Meanwhile, it’s not just postal services that Republicans would rather build in Iraq than in Idaho. All those Republicans refusing to fund schools and infrastructure to create jobs were happy to use deficit spending to do so in Iraq and Afganistan. These things–schools and highways and post offices–are what make us a country, a country that includes cities and suburbs and rural areas. But Republicans think we can’t or don’t need to afford to be a country anymore. Republicans are literally choosing to fund our empire over our own country. I guess that makes it clear where their priorities lie. You know, this IS interesting,considering the state just below Idaho is Utah- a veritable hot bed for NSA data mining and storage. I would doubt that Utahans(? )-as opposed to Idahoans- have difficulty with broadband access,or do they? To wit,a comment from this blog,last year. Suresh Venkatasubramanian, assistant professor of computer science, will present his method Wednesday at an academic conference in Washington, D.C. As the government, researchers, social networking sites and businesses gather more and more information, it’s becoming a mammoth task to sort through it all.It’s a paradox, he said. “You want a richer description of your data, but you pay for it. Every time you add a dimension, it slows you down that much more.”Venkatasubramanian’s research has found a way to reduce the variables in any data set to zero in on its most important elements. The professor said that while current computer programs struggle to analyze data from 5,000 people, his program smoothly handles information from more than 50,000. U. researchers meeting with NSA on data mining work | Deseret NewsJul 26, 2010 … U. researchers meeting with NSA on data mining work | Deseret News. @Gitcheegumee: Note the NYT story says there’s an FBI center in ID. But the implication is they pay top dollar to get reliable broadband. Also, the mountain ranges work much differently in UT–East-West Wasatch, with very clear skies for the population centers like SLC (there’s a hang gliding site between SLC and Provo where you can glide something like 270 days a year, partly bc SLC has amazingly nice weather IMO. I imagine broadband access is much worse in S UT than up north by ID (though Pocatello is the first city w/in ID and is culturally very Utahan). I think this knowing down deep of what the US has done in Iraq has caused a slow growing depression here in the states. Stated another way, there just is not enough of a market in Idaho to invest in infrastructure to support free enterprise so people can make money!! I assume that is what it is all about! 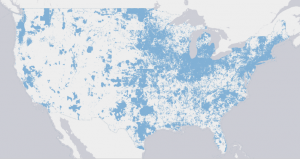 Funny how a lack of broadband access generally geographically comports with Repug red state constituencies. It’s almost if Cantor & Company are desirous of keeping their low-information voters in the dark…ages. While supporting reconstruction for Iraq, and other forms of foreign aid to that country and the region, I thought I would separate out some statistics I saw recently concerning broadband, and then comparing that to Idaho. vBrazil land surface area 3.3 million sq. mi. <a href="Total population of Brazil 194 million. Brazil is one of the “emerging” economies in the cluster known as BRIC, Brazil, Russia, India, China. Idaho’s gross state product in 2008 was $52 billion. ID population 1.5 million in 2010. Idaho land surface area 82,000 sq. mi. ** Even basic wireless is borderline at 700 kbps in a shared topology for three homes; for example to see a US Senate hearing in RealTime, or to view a YouTube video clip, the audio is continuous usually but sometimes is choppy, and the concurrent video freezes every few seconds, although the audio continues. I suppose each home is receiving only 200+ kbps bandwidth in this configuration. So parts of Iraq have hi speed internet. I am sure they are thankful, makes the war worth it. Please share some of your high information ideas with us, I need to see the light. @MP: Have you anything worthwhile to say or are you merely trolling here? Thought my comment was worthwhile, then again I may not have the proper information. Maybe all of the Islamophobia and hysteria over sharia will turn out to be a good thing. It might convince the US to invade the US and engage in nation building. The people in Idaho should convert to Islam. So, we go into a false war on 16 words. Members of the GOP were responsible for those sixteen words. The US breaks everything in sight and has to rebuild (key word, rebuild). The war breaks our national budget. The war is not a stimulus. Our tax dollars for infrastructure go to another nation. And the GOP stand their ground to cut the budget and not fund infrastructure in the US? Sounds like the behavior of an addict. Lie. Lie some more. Indulge in destruction all the while playing the victim and not giving a dam about who you destroy or the cost. MadDog was basing his broadband comment @ 7 on the map links in EW’s post. I do not think MP realized where you were getting your info from. Then again, I could be wrong on bot counts. Just to clarify, Idaho was the 43rd state.